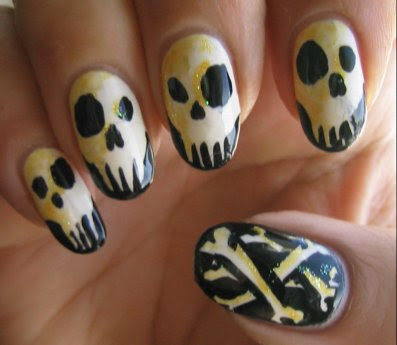 I sported this mani over Halloween weekend but I only just got the photos off my camera to post! Sorry about the blur. These were taken just before heading out the door to go shopping where I was sure I'd wreck at least one tip. Plus camera drama. My little guy got hold of it and busted the screen so it's difficult to see if I'm even in macro mode. I dig the thumb of my left hand. Big meanie superskull followed by all his cute wittle skully minions. This is amazing! My new favorite Halloween manicure! I'm saving this for inspiration next year. Your bones are crazy good!! 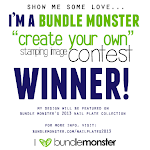 This would have won any contest you entered it into. Seriously. 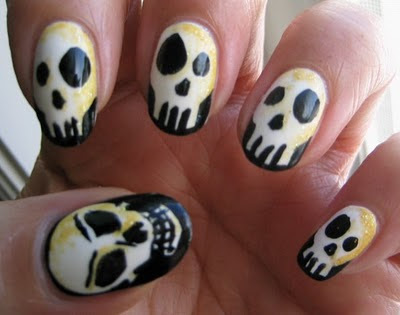 I want this manicure for myself next year. Or maybe at Mayloween. Either way. It's phenomenal. Ew, creepy! That of course means you did a great job on them! Sarah: Mayloween! I wanna! I wish I could be in loops for that!